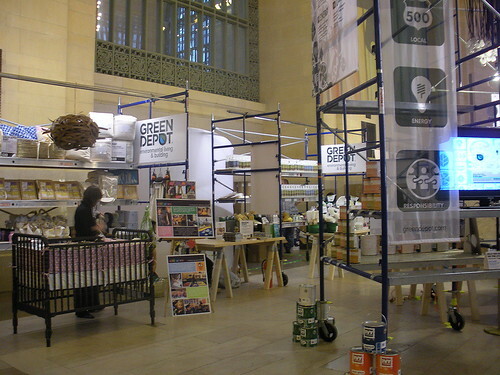 As part of Earth Day New York’s annual festival, taking place today and tomorrow at Grand Central Terminal, Brooklyn-based eco-friendly buildings products supplier Green Depot is debuting their new Pop-Up store, which promotes the company’s Do-It-Yourself motto while providing sustainable building materials, products, and accessories to an commuter consumer-base on the go. Designed Colin Brice and Caleb Mulvena of New-York based firm Mapos, who are also the designers of Green Depot’s new flagship store on the Bowery in Manhattan, the Pop-Up store is a flexible and mobile space that facilities Green Depot’s design principle of easy, affordable, and gratifying green living and building. Drawing from the store’s original concepts, the Pop-Up store also features a series of visible “building slices,” which reveal the materials and supplies used in green building design, and interactive educational booths that allow green design to be accessible to all. 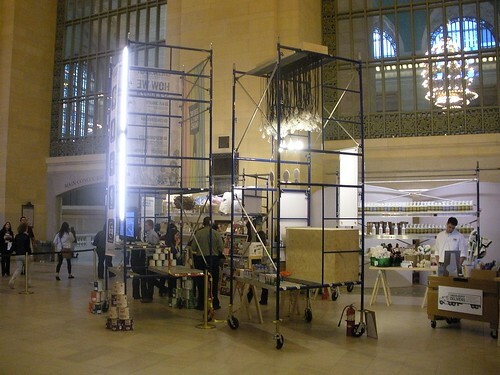 The 1,000-square-foot store is made out of traditional scaffolding elements that are easy-to-assemble and can be arranged in multiple formations. After its run in New York, the installation will be packaged and shipped to Green Depot’s new Chicago showroom where the signage materials and floor fixtures will be reused, keeping with the company’s philosophy.